The AeroPress is a small serving coffee/espresso maker with a cult following. We love this coffee maker! It's been a staple in our kitchen for years and we keep coming back for the ease of use and amazing coffee that it produces. 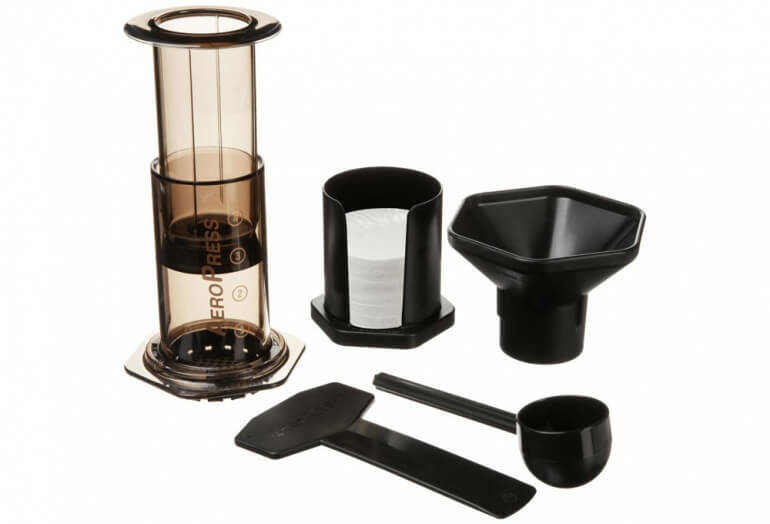 The AeroPress is a unique press coffee maker. The ability to quickly make a single cup of delicious coffee sets this coffee maker apart. This unique system was created by Alan Adler. Alan is the name behind Aerobie. He is the same inventor who brought you the Aerobie flying ring and many other sport toys. This coffee maker allows you to brew from 1 to 4 cups of delicious espresso-strength coffee. There have been many debates about if the AeroPress really brews true espresso. While we don't want to take a stance in the debate, the simple fact is tha the coffee that this little press creates is world-renound. In fact, the coffee is so good that a cult following has formed around it. There is even a yearly World AeroPress Championship which has been running since 2008. You brew coffee by placing the Aeropress directly over the cup or mug you plan to drink from. In addition to these directions, we've included a video above which shows this entire process in action. You place one of the included paper filters in the end cap and screw it on. Coffee grounds are poured into the cap and shaken to level. You pour hot water over the grounds, stir and insert the plunger into the base. Using a short press you push the water through the grounds, directly into your cup. Add hot water and cream/sugar as preferred and enjoy! 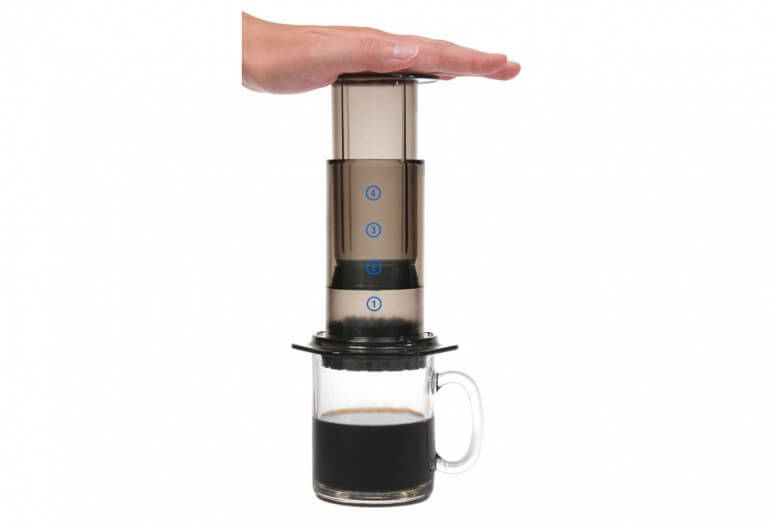 The Aeropress is perfect for anyone looking for an easy to use, easy to clean single serving coffee maker! Be sure to see our article which features other coffee makers that are perfect for travel. Reusable metal filters for your AeroPress coffee maker. The STARESSO is a compact and portable espresso maker with a few extra tricks up it's sleeve. Collapsible silicone pour over coffee maker with case. Grind and brew from whole beans with this self contained pour-over coffee maker. 0.5 liter travel kettle for boiling water on the go. A pump-powered handheld espresso maker perfect for travelling. Hand pumped portable coffee maker that produces true espresso. Pump action single serving coffee maker. A travel coffee mug with built in french press. Simple, yet effective silicone pour over coffee maker perfect for travelling. This portable steam-free frother quickly froths milk for coffee or hot chocolate. Bodum quality french press in a to-go travel mug.